It’s that time of the year, when thousands of sharks are migrating just off our coast. Experts say for the next two months we can expect large shark populations thanks to colder water up north. 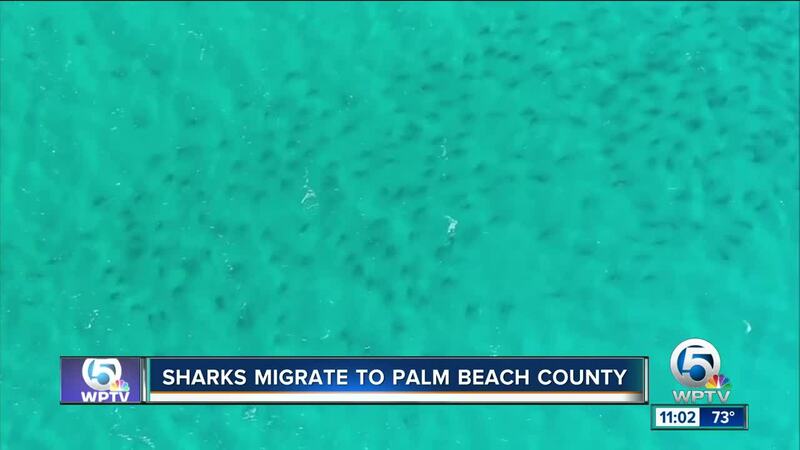 PALM BEACH, Fla -- It’s that time of the year, when thousands of sharks are migrating just off our coast. Experts say for the next two months we can expect large shark populations thanks to colder water up north. “it’s an amazing spectacle to see,” said Jim Abernethy. Abernethy owns and runs a shark diving expedition company out of Lake Park. “In fact, it’s a $323 million a year industry right here in Florida,” said Abernathy. When he’s not getting up close and personal with sharks miles off the coast of Palm Beach, he’s in the air watching the Black Tip sharks migrate. “The migration comes down here following three different types of bait fish and they hang out and accumulate in this area,” said Abernethy. Now if you head to the beach and plan to swim in the water Abernethy recommends staying clear of any lines in the water. “We use the same kind of bait to attract them and they don’t know so there’s lots of sharks around the 24 hour fishing piers,” said Abernethy. However, new research numbers from the University of Florida show shark attacks are down with 16 reported in 2018 along the Florida coast. Experts say believe it or not shark attacks are unlikely during shark migrations. CLICK HERE for more on the research.